This Plant is a Gas! Dictamnus albus, a.k.a. the gas plant, is a beautiful perennial that is hard to find and therefore underused in the garden. It’s such a shame because this is truly a magnificent and long-lived plant. A mature clump of Dictamnus provides a showy focal point in the garden. We grew Dictamnus for many years at Viette’s. They came bare root every year in our big winter shipment from Holland. I remember how exciting it was to unpack those huge boxes of bare root plants when they arrived. The boxes were layer packed in peat and each new layer was like a Christmas present – Aconitum, Aruncus, Astilbe, Astrantia, Dictamnus, Helenium, Kirengeshoma, Ligularia, Rodgersia, Sidalcea, and so many more awesome perennials! The bare root Dictamnus were like sticks with roots. We potted them up into one gallon pots and they grew VERY slowly. They never looked like much in the pots – they were always kind of scrawny and they rarely flowered. The plants we brought in were at least 2-year old plants so they filled out pretty well, but they were still a hard sell – that is until they came into bloom in the Viette gardens. When these gorgeous plants were in flower, they sold themselves! 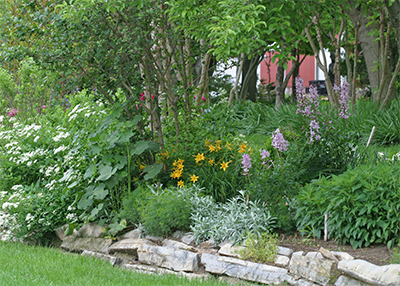 That’s the wonderful thing about having beautiful display gardens surrounding your garden center. Blooming plants are very good at selling themselves! 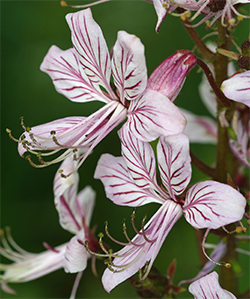 Dictamnus albus ‘Purpureus’ has striking blush pink flowers with deep pink veins. Mature Dictamnus grow to 36″ tall and have beautiful glossy green, leathery foliage that forms an attractive clump in the garden. They start out slowly but after about 4-5 years in the ground, they really take off and begin to bloom reliably year after year. These plants are worth the wait! 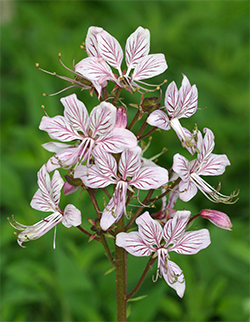 There are basically two choices when it comes to Dictamnus; the white form, Dictamnus albus, and a blush pink form, Dictamnus albus ‘Purpureus’ which is my favorite. 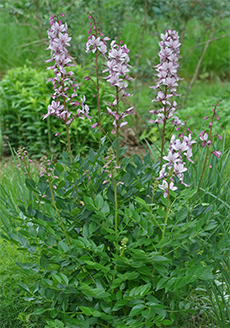 In late spring and early summer, showy spikes of these pink or white flowers rise above the foliage and add a bright spot of color to the sunny garden. As an added bonus, the flowers have a pleasant lemony fragrance as does the foliage. The name gas plant comes from an odd characteristic of this plant that, in hot weather, the foliage emits a pleasantly fragrant but flammable gas just beneath the flowers. On windless summer evenings, the gas can be ignited with a match. It’s kind of neat because it results in a brief vapor burn that looks really cool but is harmless to the plant. I can remember some of the guys at the nursery having fun “lighting up” the Dictamnus in the garden during evening breaks when we worked late during the shipping season. Never a dull moment! There is a downside though. This fun, flammable gas and the lovely lemony fragrance of the plant come from an oil in the foliage which can cause fairly severe skin irritation in some people. I must be one of those people because years ago, I was careless around the plants and ended up with some pretty painful burns on my arms that lasted for a week or so – and I’m not even allergic to poison ivy! Luckily not everyone is allergic to the oil and since this is a fairly low-maintenance plant, once you get it in the ground, you shouldn’t have to do much except stand back and enjoy its beauty! Dictamnus combines well with other sun-loving perennials like daylilies, bush clematis, Coreopsis, Rudbeckia, and peonies. wow, sounds like a great perennial garden plant!